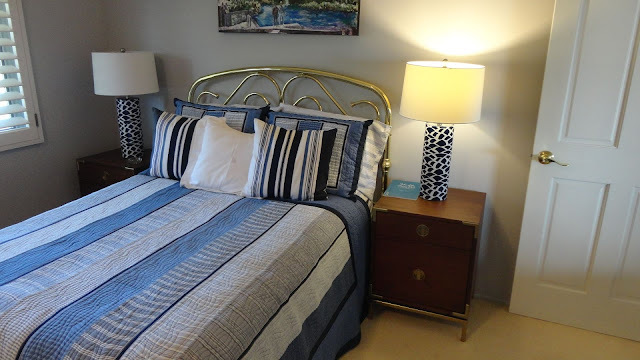 Nancy and I connected via twitter and became Facebook friends many years ago, and I was so excited when she gave us a call last fall to order lamps for a client's guest room re-do. The room turned out great. Nancy was so generous to send pics (we love our customers!) and answer some quick questions about her ideas for her Blue and White Room Re-Do design - enjoy! Phew! Coming up for air after our 3-day power shopping trip in Las Vegas and then major editing on our website. So much work to do some days! We go to market in Atlanta, New York, Seattle and Las Vegas, just to make sure that the products that we choose to add on the site are actually what the catalog pictures look like. Frequently I am so surprised that what we've chosen is actually much better than what we expect. 1. What inspired the remodel? Life Change? Downsizing? Looks like your client had a child go off to college? The client is a widow in her 80's. 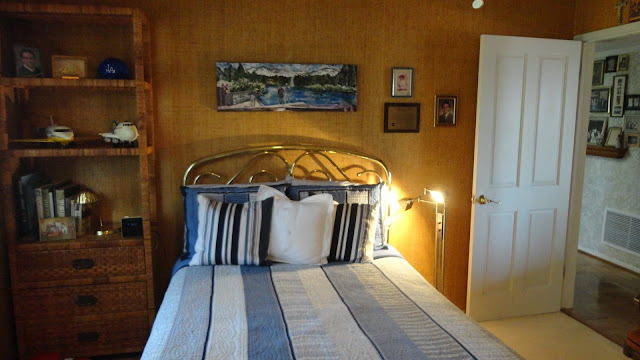 This room has not been touched since her son lived at home, and now she is updating the home to feel more modern. This room is used by her grandchildren now, and it felt very dark and very dated. 2. Loved that you kept the blue and white theme! Do your clients live near water? Nancy: She doesn't live at the beach, but is about 3 miles from the ocean. The son's room had a nautical scheme and she wanted to keep parts of it. 3. Such a great use of side tables and moving out the large rattan shelving unit! Did you repurpose it in another room? Nancy: The room is actually not finished in these photos. We are currently re-upholstering a chair for the other side of the room. The new headboard is still coming in also. The rattan furniture was moved to the other side of the room and we picked a campaign style for the new pieces with brass accents that work with it. 4. Was it difficult to paint/remove the textured wall in the before and after pics? Any tips? Nancy: She hired a professional contractor to do the walls, so I am sure that they were experienced in wallcovering removal. Best Tip? Hire a pro! 5. Just out of curiousity, why did you choose our Blue Pesce Lamps? P.S. They look great in your new space! Nancy: We looked at several different lamps, but narrowed down to 2 or 3. 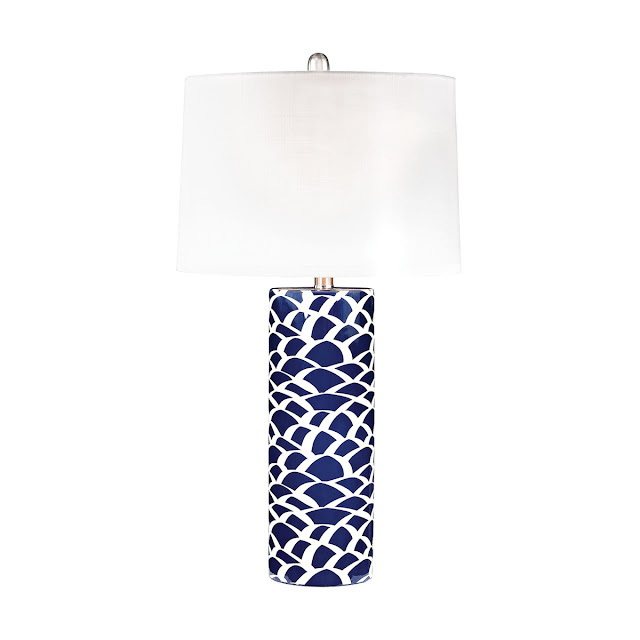 We all liked the looks of these lamps with their unique pattern and crisp colors. A glam modern Hermosa Beach Bedroom design that they completed a few years ago - love the clean look! P.S. We love it when our customers share their new Caron's Beach House decor with us - Tag us @caronsbeachhs on Instagram or post on our Facebook page with a pic of your cool coastal decor from our store for your opportunity to be featured too! We will also enter your name into our February drawing for a chance to win a $50.00 gift certificate from our store! Thank you I really love those lamps! Thanks so much, so sorry that we did not see your comment until today!